2013, ISBN 9784788513242, Shinyōsha, Tokyo, 380 p.
This volume compares Japan and Germany from the perspective of life-course research. Divided into the three interrelated sections work, family and housing, the chapters explore the effects socio-economic issues such as population aging and the ongoing restructuring of the labor market have on individual choices. Throughout the book, particular attention is paid to issues arising from gender and age differences. 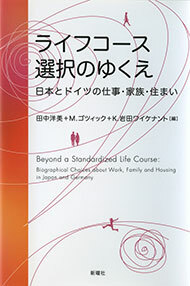 The analysis of media representations of the changing life-course is another distinguishing feature of the book. Flexibilization in The German Labor Market: Towards a Self-Directed Working Life in Germany's Media Industry? Life Courses, Housing and Elderly Women in Japan: Why do They Choose Communal Living?